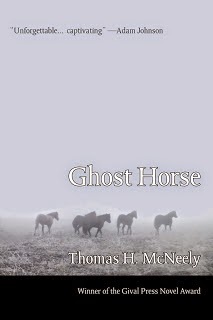 Ghost Horse, by Thomas McNeely, is deeply rewarding for readers who appreciate a book in which every scene and every object are carries a weighty and sinister meaning. This is a world worth immersing oneself in, but beware: the water is deep. The book is set in 1970s Texas and focuses on an boy who attempts to piece together a world of contradictions: adult / child, truth / lie, dream / reality, Latino / Caucasian. Even as those around him tell him he is childish, Buddy struggles manfully to resolve both his inner and outer conflicts, even those that are beyond his eleven-year-old depth. McNeely writes with eerie precision the feelings of a child who must fit adult experiences into their frame of reference. Buddy informs readers that he and his Latino friend Alex used to watch old movies such as Nosferatu and Vampire Circus together, though he believes that there are some scenes the scenes that “seemed to go on forever, because it made no sense,” in which a witch doctor circles around and around his victim while she laughs and cries at the same time. High points for style, since this striking image sums up our main character’s situation in several ways. The witch-doctor who circles around his victim echoes Buddy’s own predicament, feeling as if he must circle on the edges of the same scenes, the same arguments, the same promises made and broken. That is not all. For the reader who pays attention, there is are myriad call-backs to the central themes, among them the fact that Buddy and his Caucasian friend Simon indulge the kind of repetitive play often exhibited by children who have suffered abuse. McNeely also seems to be familiar with the secret language of symbols and words that pervades the world of children who grow up with long-term, complex trauma. Through the lens of a cautious child, we see the changes wreaked across social landscape of Texas in issues of race, music, class and gender roles. This has the potential to be preachy and tiresome, but McNeely uses the point-of-view to his advantage: no one apologizes, nothing is explained. Buddy and the readers are offered a glimpse into murky and sometimes frightening worlds and are left to make their own sense of what happens. Creepy visuals pervade the narrative: people’s faces as masks they wear, a rotting snake preserved in formaldehyde, a boy with no face, a world made of glass, boys who were killed and buried in a field, and of course, a Ghost Horse that died when in the sucking mud of a swamp pool. These images are not merely presented for cheap thrills. Each contains a deeper psychological creepiness because they contain elements of the rot spreading across Buddy’s world. If you want a book that tells you what to think, then Ghost Horse is not for you. If you require a book where lines are clearly drawn between the Dark Side and Light Side, Ghost Horse will make you deeply uncomfortable. I enjoy moral gray areas and feeling my way in the dark, yet this book managed to unsettle even me. If you believe that a book should push you off balance and take you somewhere new, then Ghost Horse will deliver. This book takes a certain amount of effort from the reader, but it gives back and then some. Ghost Horse will be available October 2014 from Gival Press. It won the 2013 Gival Press Novel Award and was nominated for the 2014 Pulitzer. It is currently available on Amazon and at Thomas McNeely's website.